When does it all fall apart again? We don’t know as it takes a spark somewhere to stop the wheels of capitalism from spinning. Why are we surprised when the economy does it what it regularly does and go into a crisis our current form of capitalism has seen a few of these crisis over the past few decades as bubbles burst. Maybe we need to have a bonfire of capital occasionally so that it can be recreated again, only problem is every time we have a economic problem our economies have not been designed to withstand them, we do not plan for the downs in capitalist economic cycles for some reason. Now the Guardian newspaper has articles like this one World leaders play war games as the next financial crisis looms by Larry Elliot. We will always have debt as it is part of how we raise money but we also need markets to function and they need to be controlled (topic of another story one day) but often we are told that the MARKET as if it is a thing with its own identity and political agenda needs this or that without really looking at what the market really is. We need to control our economies for the good of all not just the wealthy and often that market is because the wealthy are not making as much money as they want to on their capital. Most of us do not have capital, we are lucky to even have savings especially if you are one of the precariat, you are just getting by from month to month. We are constantly told that we have to tighten our belts and take job cuts to public sector jobs, yet this is a political idea begin forced though by the Tories that Labour has signed up to much to their great shame as this is playing the neo-liberal economic game. We have other alternatives, but as Margaret Thatcher said to that ‘TINA’ (There Is No Alternative). It is just that we are not even given these by the political elites beholden to money and power interests. Then we expected to go and vote for political parties that are just different shades of the same thing, no wonder we do not feel positive about the future when we do not feel that we have recovered form the last economic bashing that we took and the resulting fallout since the 2008 crash. Part of the reason we have not got over that economically is that the thinking that got us there is still the thinking that is mainstream in our political agendas it is time to find a new thought process and develop new ideas or better still explore some that are outside the mainstream. This thought actually scares the political elites as we might just have to really take a step in developing new political structures and parties that will make a difference to everyones lives. There is money out there and there is no reason that we can’t pay for everyone to have a good quality of life and move beyond the shirkers and benefit scroungers debate. Especially when the corporate cultures that we have are in fact the biggest benefactors of the states largesse, the ones who though deceit or just plain rigging of the system to there benefit because they can get the most and we are silent on that topic. Time to direct our anger at the correct targets, so that we can make a difference that is positive for all of us. 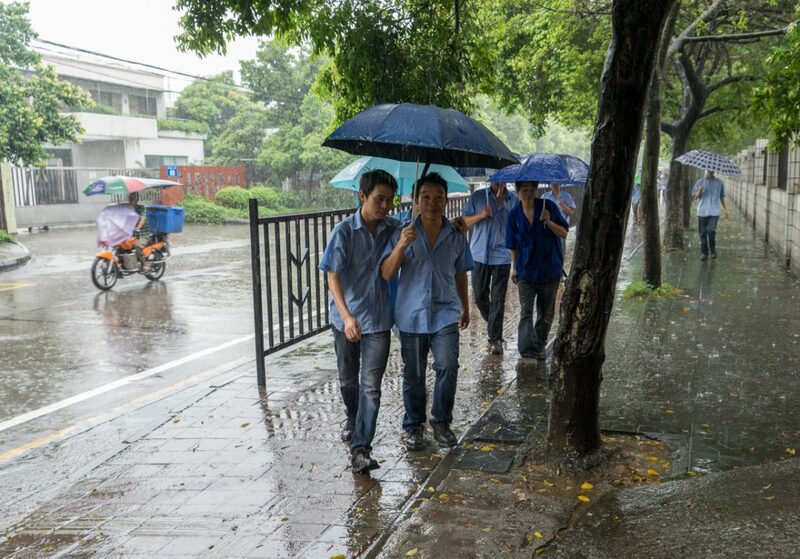 Factory workers in Guangzhou, China going for lunch on a wet and rainy day.